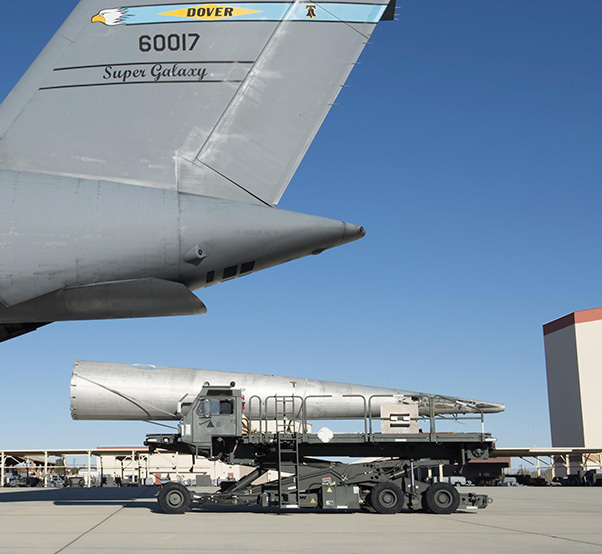 A tail-boom from the Fairchild C-119B Flying Boxcar #48-0352 “Am Can Co Special” is loaded into a C-5M Super Galaxy Dec. 19, 2016, at Edwards Air Force Base, Calif. This C-119 airdropped mobile bridge sections during the Battle of Chosin Reservoir during the Korean War. 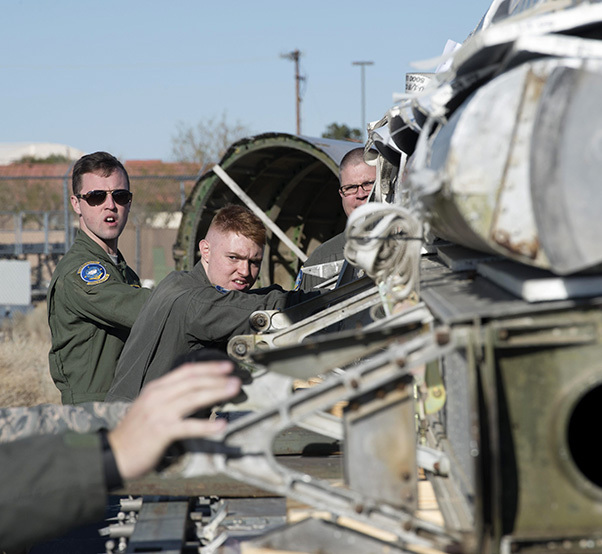 A true piece of American history that has sat in the Mojave Desert for decades and was slated to be turned into scrap metal will now have a new home at the Air Mobility Command Museum. A C-5M Super Galaxy, operated by the 709th Airlift Squadron, and an AMC Museum team traveled to Edwards Air Force Base, Calif., Dec. 16-19, 2016, to transport portions of the Fairchild C-119B Flying Boxcar #48-0352 “Am Can Co Special” to the AMC Museum at Dover Air Force Base, Del., for restoration and display. The C-119 was a military transport aircraft used primarily to carry cargo, personnel and equipment. It also had airdrop capabilities. The U.S. flew them from 1947 to 1974. According to John Taylor, AMC Museum director, when this C-119 arrives at the museum, it will be arguably the most historic aircraft in its collection. Known for its fierce fighting and freezing weather, the Battle of Chosin Reservoir, Nov. 27 to Dec. 13, 1950, took place during the early stages of the Korean War. United Nations forces, comprised mainly of South Korean, American and British troops, had recently pushed the invading North Korean Army out of South Korean back north of the 38th parallel. Not stopping at the border, the UN forces continued pushing north to destroy any and all remnants of the North Korean Army. They soon approached North Korea’s border with China. This provoked China, a North Korean alley and fellow communist state, causing it to intervene in the war by sending hundreds-of-thousands of troops south to stop the advancing UN forces. Master Sgt. 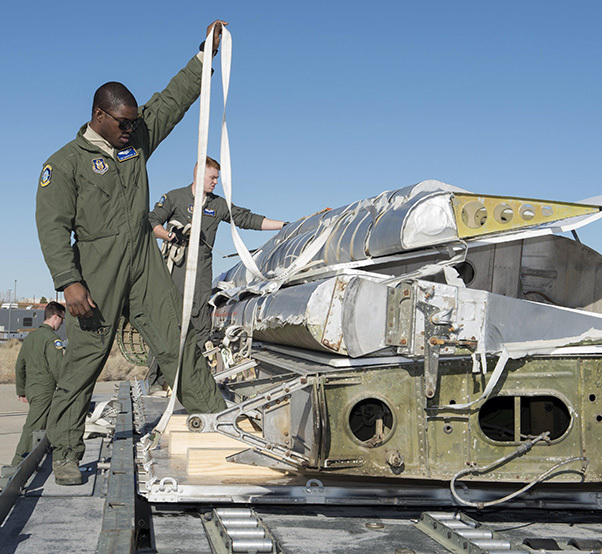 Paul Adkins, 709th Airlift Squadron loadmaster, lifts a tail-boom from the Fairchild C-119B Flying Boxcar #48-0352 “Am Can Co Special” during a mission to bring it to the Air Mobility Command Museum via a C-5M Super Galaxy airlifter Dec. 17, 2016, at Edwards Air Force Base, Calif. C-119 are a twin tail-boomed cargo aircraft. The blocked evacuation route was between Koto-ri and Hungnam. Surrounded by more than 120,000 Chinese soldiers, the trapped 30,000 UN troops were running out of options. A decision was made to airdrop mobile bridge sections to these forces, with the hope that they could be used to rebuild the bridge, affectively giving them an escape route. Eight C-119s, operated by the 314th Troop Carrier Group out of Ashiya Air Base, Japan, gathered to complete this mission. Out of the eight bridge sections dropped by parachute, four were used to build a usable bridge. This opened up a way for retreating UN forces. 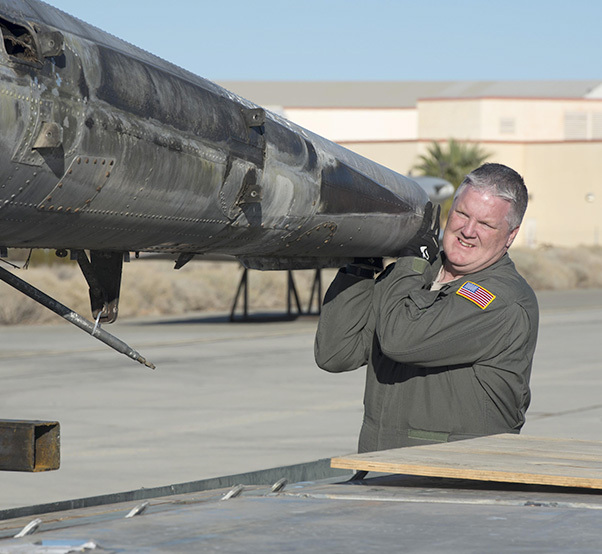 Les Polley, AMC Museum aircraft restoration chief, was on the team that travelled to Edwards AFB to pick up the C-119. He is happy that this plane is coming to the museum. Work for the C-5M and 709th AS maybe over, but it has just started for Polley and his restoration crew. 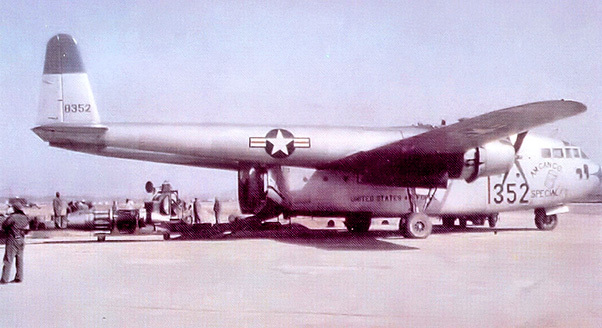 An early photo of the 314th Troop Carrier Group’s Fairchild C-119B Flying Boxcar #48-352 operating from a base in South Korea in 1953. 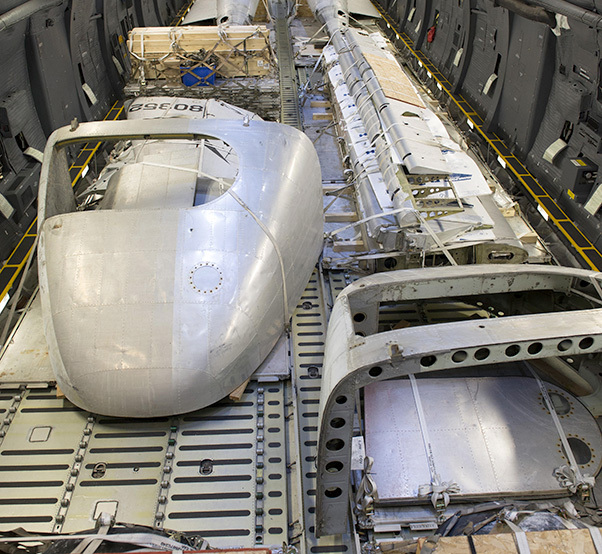 This is the exact C-119 that is being transported to the Air Mobility Command Museum at Dover Air Force Base, Del., for restoration and display. This C-119 served well past the Korean War. It ended its 17-year career with the 911th TCGat the Greater Pittsburgh International Airport in 1966. Polley estimates that the whole restoration process will take a minimum of two years before for the C-119 is ready for display. Master Sgt. Paul Adkins, 709th Airlift Squadron loadmaster, martials a K-Loader, carrying the wings of the Fairchild C-119B Flying Boxcar #48-0352 “Am Can Co Special,” toward the forward cargo entrance of a C-5M Super Galaxy Dec. 19, 2016, at Edwards Air Force Base, Calif. Once restored, the C-119 will be on display at the Air Mobility Command Museum on Dover AFB, Del. Master Sgt. 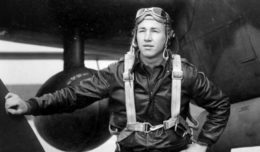 Paul Adkins, 709th Airlift Squadron loadmaster, and Master Sgt. 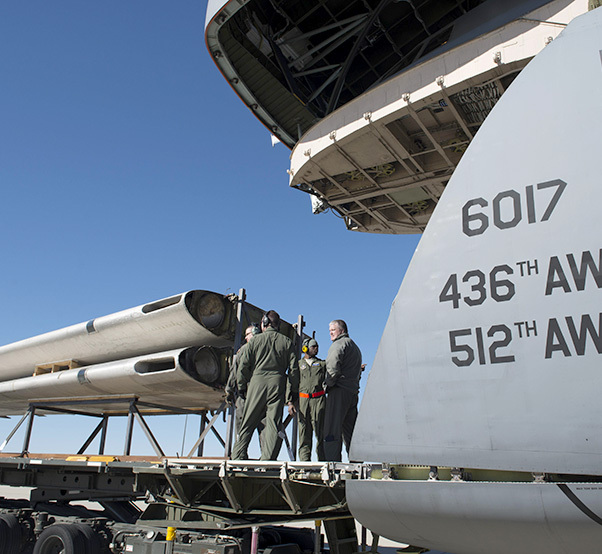 Bryan Muise, 709th AS loadmaster, martial a K-Loader, carrying a tail-boom from the Fairchild C-119B Flying Boxcar #48-0352 “Am Can Co Special,” toward the rear-cargo entrance of a C-5M Super Galaxy Dec. 19, 2016, at Edwards Air Force Base, Calif. This C-119 will be arguably the most historic aircraft in the Air Mobility Command Museum’s collection. Staff Sgt. 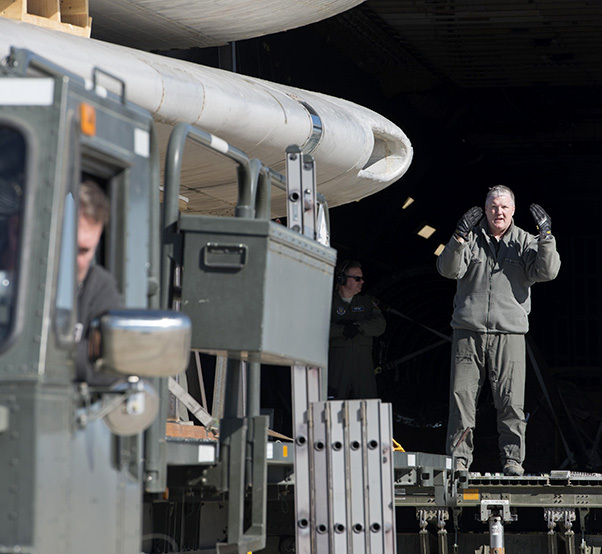 Martin Guy, 709th Airlift Squadron loadmaster, straps down portions of the Fairchild C-119B Flying Boxcar #48-0352 “Am Can Co Special” to a pallet during a mission to bring it to the AMC Museum via a C-5M Super Galaxy airlifter Dec. 17, 2016, at Edwards Air Force Base, Calif. 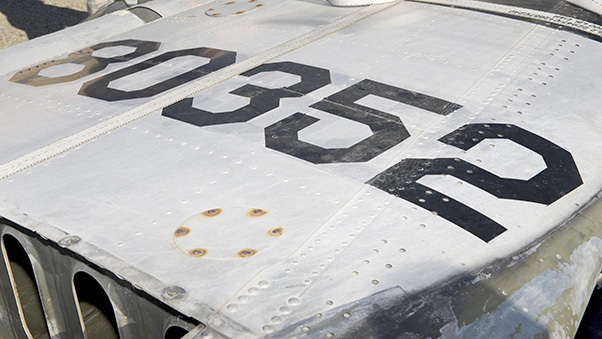 Restoration work on the C-119 will take a minimum of two years. 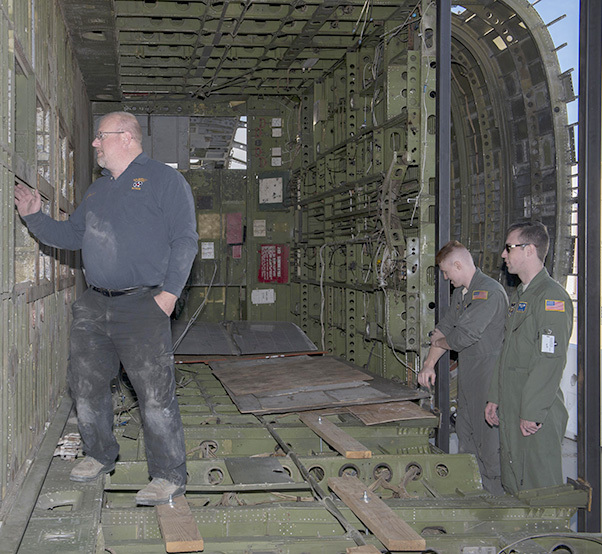 Les Polley, Air Mobility Command Museum aircraft restoration chief, inspects the interior fuselage of the Fairchild C-119B Flying Boxcar #48-0352 “Am Can Co Special” during a mission to bring it to the AMC Museum via a C-5M Super Galaxy airlifter Dec. 17, 2016, at Edwards Air Force Base, Calif. A full restoration will take place on the C-119 once it arrives at the AMC Museum. The tail markings on the tail section of the Fairchild C-119B Flying Boxcar #48-0352 “Am Can Co Special” Dec. 17, 2016, at Edwards Air Force Base, Calif. C-119s were built at Fairchild’s Hagerstown, Md. Factory. 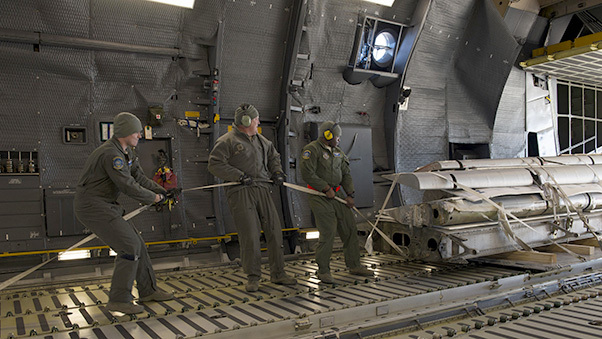 Loadmasters from the 709th Airlift Squadron load portions of the Fairchild C-119B Flying Boxcar #48-0352 “Am Can Co Special” onto a K-Loader during a mission to bring it to the Air Mobility Command Museum via a C-5M Super Galaxy airlifter Dec. 17, 2016, at Edwards Air Force Base, Calif. The C-119 was a military transport aircraft used primarily to carry cargo, personnel and equipment. It also had airdrop capabilities. 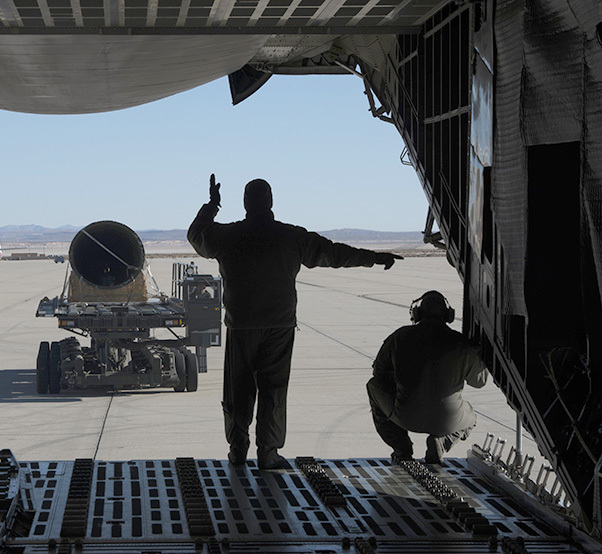 Loadmasters from the 709th Airlift Squadron prepare to load the wings of the Fairchild C-119B Flying Boxcar #48-0352 “Am Can Co Special” into a C-5M Super Galaxy Dec. 19, 2016, at Edwards Air Force Base, Calif. The wings were the only portions of the C-119 to be loaded through the C-5M’s forward ramp. Portions of the Fairchild C-119B Flying Boxcar #48-0352 “Am Can Co Special” sit inside a C-5M Super Galaxy’s cargo bay during a mission to bring it to the Air Mobility Command Museum Dec. 19, 2016, at Edwards Air Force Base, Calif. These aircraft portions weighed around 23,000 pounds. Loadmasters from the 709th Airlift Squadron pull portions of the Fairchild C-119B Flying Boxcar #48-0352 “Am Can Co Special” into the cargo bay of a C-5M Super Galaxy Dec. 19, 2016, at Edwards Air Force Base, Calif. 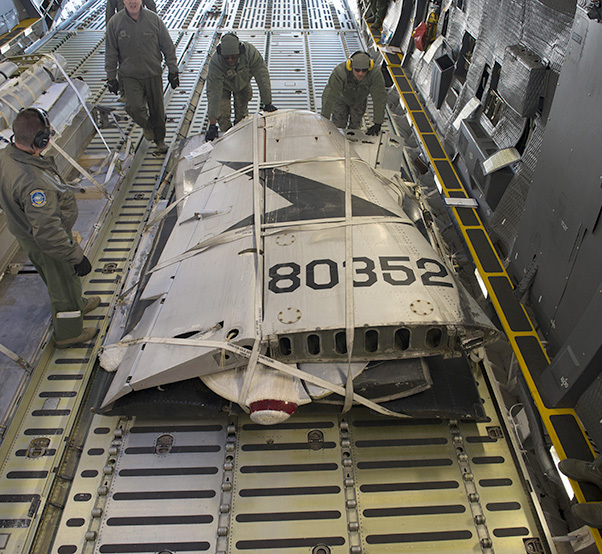 This airlift mission was used as training experience for the new loadmasters. Staff Sgt. Johnathan Barnes, 412th Logistics Readiness Squadron air transportation specialist, and Staff Sgt. Andrew Chilcoat, 412th LRS air transportation specialist, push the palletized tail section of the Fairchild C-119B Flying Boxcar #48-0352 “Am Can Co Special” into a C-5M Super Galaxy’s cargo bay Dec. 19, 2016, at Edwards Air Force Base, Calif. Barnes and Chilcoat, both stationed at Edwards AFB, were vital in logistic support of this mission.